NETWORK FINALS: Game 6 of the NBA FINALS adjusted up to 7.7, and even though the morning number was slightly below the preliminary for 2014’s Game 6, the adjusted number is 0.1 higher. The mini-JIMMY KIMMEL LIVE adjusted to 1.3. Note that Nielsen did not report final numbers for NBC’s AQUARIUS because it aired on a “sustaining” basis, without network commercials (just a few for local stations). CABLE HIGHLIGHTS: Sports topped Thursday cable, too, with 0.85 for Fox Sports 1’s English-language coverage of the COPA AMERICA US vs. Ecuador match, which also scored 0.54 for the Spanish-language version on Univision. USA’s WWE was up 0.03 to 0.60. On HGTV, FLIP OR FLOP ticked up to 0.58, and HOUSE HUNTERS rose 0.03 to 0.45, but HOUSE HUNTERS INTL fell 0.06 to 0.38, and VINTAGE FLIP was down to 0.29/0.27 from last week’s 0.41/0.34. History’s ALONE gained 0.02 to 0.46, and MOUNTAIN MEN was up 0.04 to 0.38. Bravo’s MILLION DOLLAR LISTING dropped 0.06 to 0.40. Spike’s LIP SYNC BATTLE ticked down to 0.39. 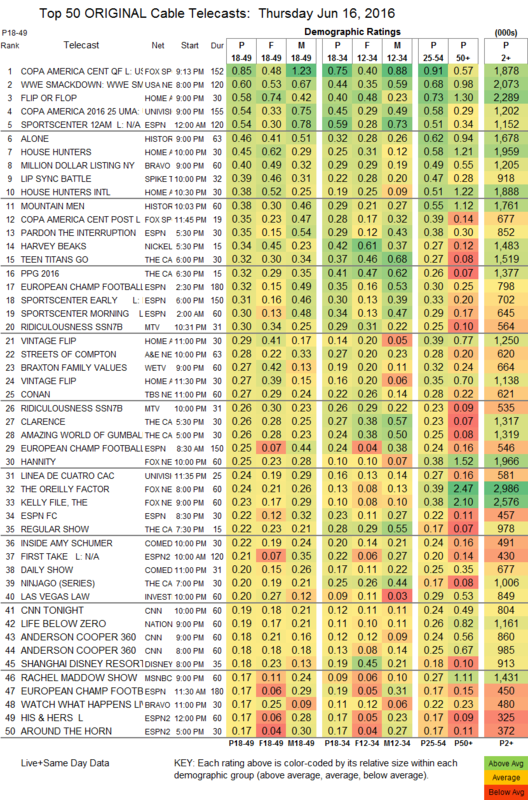 MTV’s RIDICULOUSNESS was at 0.30/0.26, compared to last week’s 0.40/0.39. A&E’s STREETS OF COMPTON fell 0.12 to 0.28. On We, BRAXTON FAMILY VALUES dropped 0.12 to 0.27, and MATCH MADE IN HEAVEN lost 0.06 to 0.14. The season finale of Comedy Central’s INSIDE AMY SCHUMER took a 0.18 tumble to 0.22. TLC’s FAT CHANCE was off by 0.06 to 0.14. 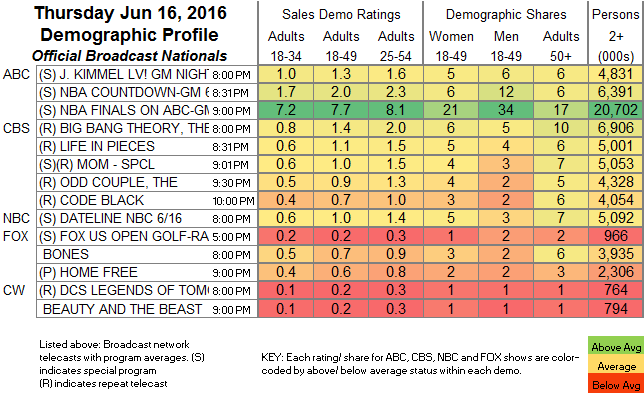 The season finale of BBCAmerica’s ORPHAN BLACK ticked up to 0.13, and AFTER THE BLACK was steady at 0.06. Tru’s COMEDY KNOCKOUT added a hundredth to 0.11. Showtime’s SUBMISSION finale held at 0.02/116K.